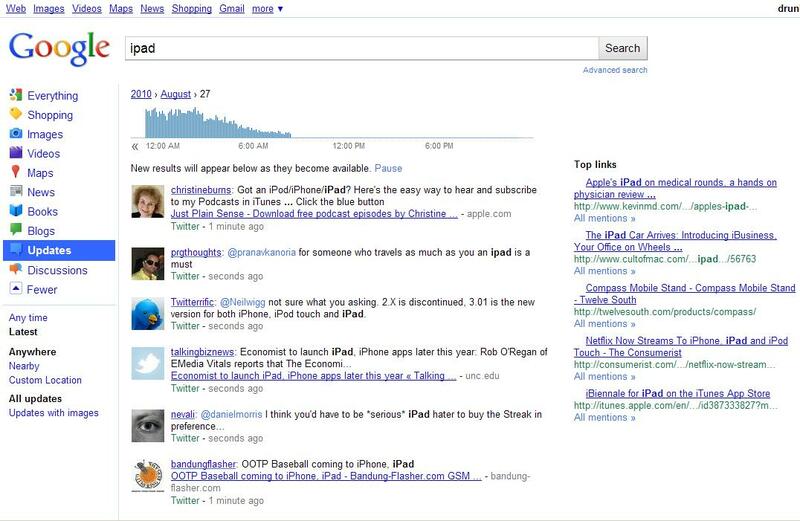 Google has tuned up their Realtime Search and is letting it loose on the public. The greater Web world, including consumers, might not yet be aware of this search revolution but marketers and Web business need to take notice -- now. Upon entering a search query, Realtime Search pulls in updates in real time, as fast as the user on the other end clicks a button. Currently, Twitter posts are being indexed but Google says it will be including updates from Facebook, Buzz, blogs and, inevitably, updates from Google's own rumored social network. So what does this offer Web workers and marketers? Sentiment analysis. With one simple search, you can get an intimate look into the minds of Web users -- what they are saying about a particular topic, breaking story, product, company or anything else you can imagine, as it happens. This is incredibly valuable. Instead of sifting through pages of search results and visiting dozens of blogs, social networks and forums, you can sit back and literally watch the results roll in. Then content, products and services can be built, tailored and launched at the best possible time. Let's take a look at a few potential strategies with Realtime Search. Did you write a recent blog post about popular travel destinations? Have you developed an iPad app to help travelers? Do you sell travel packages? Are you a tech writer? Would it be a good time to write a blog post about the best travel apps for iPad and iPhone? Any and all of these options (and more) are viable, and with one tweet you now have a built-in target audience. Maybe you want to let them (and hopefully their followers) know about your offerings? Realtime Search is still Google search. That means you can search anything -- including competing products and companies. Find out what's being said about your biggest competitors and get ready to send counter-offers. Perhaps a consumer is not happy with their purchase? Send them a code for 10 percent off your product. On the left-side of the page, you will see options to search "Anywhere", "Nearby" and "Custom Location". This is a great opportunity to find information, gauge sentiment and target prospects based on individual markets. You can search just about any location on the planet. Obviously, the more localized you get, the fewer results. You might not want to sit in front of your computer all day watching streaming results. You don't have to. Sign up for Google Alerts for the keywords of your choice and choose "Updates" under the "Type" drop-down menu. You can then choose to receive a daily or weekly e-mail that includes Realtime results for your selected queries. If a particular update is in response to a previous conversation, you will see "Full Conversation" at the end of the result. Click that and you will see the entire thread of the conversation, however far back it goes. This is an excellent way to follow the progression of sentiment and find more than one prime target for your product, content or service. To the right of the streaming updates are "Top links". These are more traditional search results but very recent. Expect this section to grow over time. It's still unclear the criteria for these results, but it’s a good bet that they have been discussed on the realtime Web somewhere along the way. 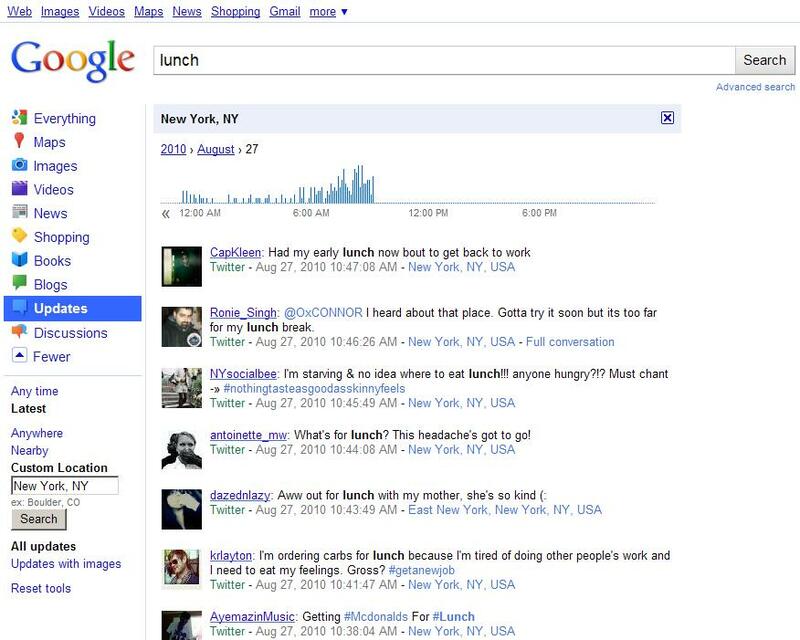 Google's Realtime Search is looking like a true search revolution. And, it's only getting started. For marketers and website owners, this is a critical research tool. It also points to the importance of your participation in the social media environment. How will you use Realtime Search for your business? Share your thoughts by leaving a comment below!